When we stand in front of a mirror, we expect to see ourselves and our environment unobstructed in the reflection. 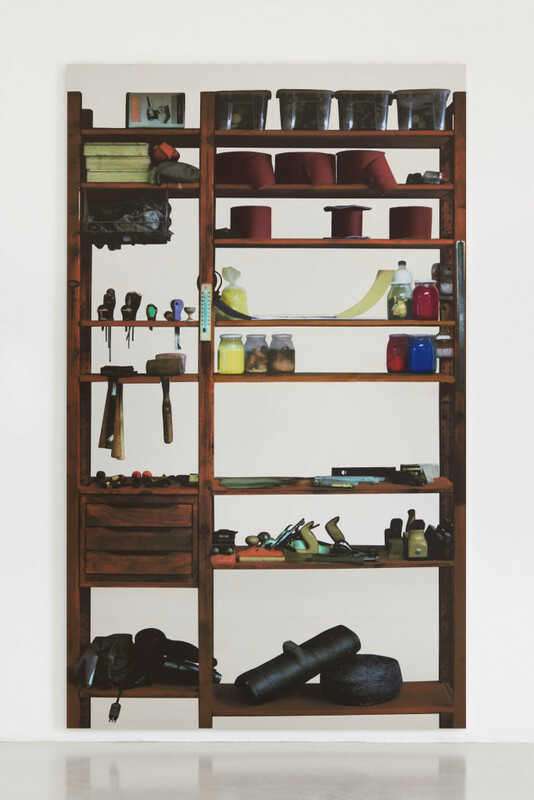 In Scaffali, the recent exhibition by Michelangelo Pistoletto on view at Luhring Augustine, we look in the mirror and find ourselves captive in a scene that is resonant for its familiar and un-magical feeling: behind a shelving unit full of artifacts of labor. Scaffali is the Italian word for “shelves”, which appear in all of the artworks in the exhibition, which Pistoletto creates through screen-printed images on large, highly polished blocks of steel that hang on the wall, almost flush with the floor. 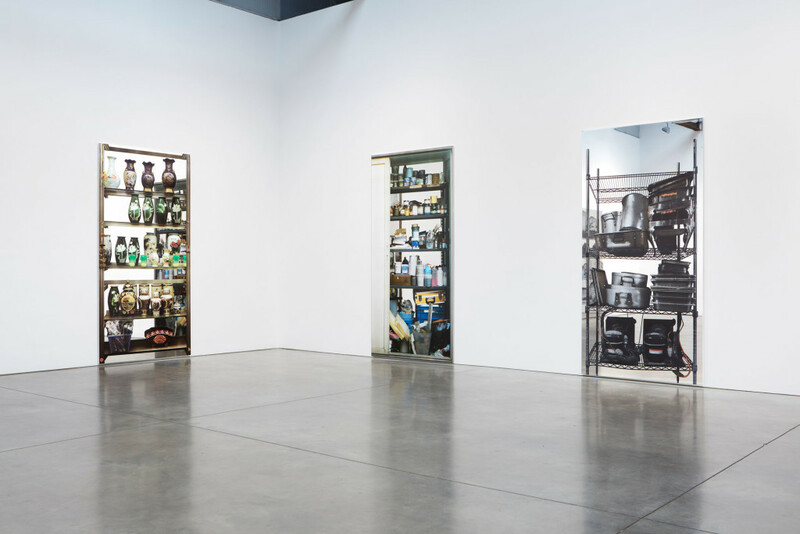 The image of shelves becomes the framing device in each of the works for various collections; old shoes, stacks of house paint and tools, pots and pans, car parts, milk crates, and so on. From a distance, the images appear photographic and scaled to the objects’ actual size, creating a convincing illusion of three-dimensionality. However, when standing close, the work—printed layers of color—become visible as separate dot-compositions, while the edges appear soft, exposing the technical process behind the work and breaking the illusion of the uncanny. Michelangelo Pistoletto; Courtesy of the artist, Luhring Augustine, New York, Galleria Christian Stein, Milan, and Simon Lee Gallery, London / Hong Kong. Scaffali demonstrates Pistoletto’s ability to give two dimensional works the authority of sculpture and performativity of the real. Each piece follows the same tight compositional framework: a shelving unit full of objects that takes up most of the picture plane. The type of shelves and objects vary from piece to piece, but the framework remains. Nevertheless, the compositions are constantly evolving as shifting scenarios are reflected in the plane. When approaching the 8 ft tall by 5 ft wide prints, the entire exhibition space is reflected in the mirrored steel and the objects printed on the surface are given context. The gallery becomes a theater set in which viewers perform, bending side to side, moving closer and further away, thoughtfully positioning themselves for selfies in which they become a character in a scene. Unlike Pistoletto’s previous mirror paintings, which have included images of people, this set of paintings implies the viewer’s reflection as an essential subject in the work. When a viewer stands in front of one of the works, their reflection appears behind the printed image, creating the illusion that the viewer is held captive within a hyperreal tableau. Furthermore, the viewer is implied in the narrative and history of the set of objects on the shelves that they stand in front of. Galleria Christian Stein, Milan, and Simon Lee Gallery, London / Hong Kong. The objects depicted vary from piece to piece, but each have a utilitarian quality that evoke labor, and therefore, class. 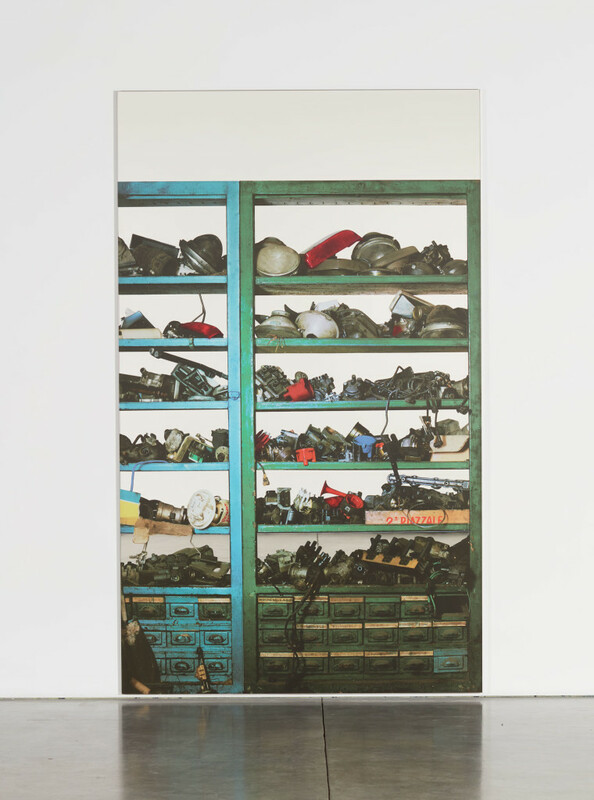 Scaffali—attrezzature elettriche (2015), or, “Shelves—electrical facility”, shows enamel coated shelves overflowing with electrical parts; Scaffali— attrezzi da falegname (2015), or, “Shelves—carpenter’s tools,” shows various woodworking tools on wooden shelves, which could have been used for domestic or contracted work. The portrayal of work through the objects is broad, as we see glimpses of domestic, retail, factory, and creative labor, to name a few. Representation and artifacts of the working-class within art world settings is a consistent theme throughout Pistoletto’s work and reminds us of his influential role in the Arte Povera movement in the 1960s–1970s. Most of the collections of objects are disorganized and lack orchestration. The casual quality with which the objects are placed on the shelves becomes documentation of workplace routines. Scaffali—con tessuti (2015), or, “Shelves—with textile” is a tableau of what one would encounter hidden in the backroom of a restaurant; metal wire shelving full of industrial linens; plastic wrapped packs of tablecloths, an unfolded pile of checkered chef pants, a chef coat hanging from a corner of the shelf. Scaffali—vasi cinesi (2016), which translates to “Shelves—Chinese vessels”, contains images of decorative Chinese vases and urns on sleek metal shelves. This print contradicts the suggestion that all of these collections exist in private by presenting a more intentionally curated group of objects that were presumably in a storefront. Scaffali—vasi cinesi points to the fact that all of the works are, in essence, window displays; presentations of artifacts and vessels for our own projection. The set of objects in this work are also unique for their cultural specificity, which carry a distinctly Chinese aesthetic—despite evoking regionality, the photo used in this print was taken in Chinatown, New York, and the style is somewhat detached from its source. Some of the photos in used in the series were taken in Havana, some in Turin, others in New York City; but in each of the works, the cultural specificity is lost in the prints. The buckets of paint, pots and pans, old shoes, and electrical equipment have a generic quality without references to time or location. The mirrored reflection is what provides the context, allowing the viewer and the gallery space to complete the image. Within these environments, the setting as well as the viewers are interchangeable, and the only constant is the accumulated objects which the viewer is subject to. The worn-down utilitarian quality of the objects contrast with the clean openness of the gallery space. Surely the works would have an altogether different feeling if installed in a city apartment, a factory, the artist’s studio, or anywhere else. The viewer’s reflection becomes a surrogate for both the laborer who once accessed the shelved objects in the prints, and as an onlooker from outside looking in, as if through a window. The role of the viewer within the work constantly shifts from being that of a passive observer to an active performer. This inherent tension allows the steel planks to achieve the presence of existing as flat paintings as well as interactive sculptures. Scaffali by Michelangelo Pistoletto at Luhring Augustine was on view November 4–December 22, 2017. January 30, 2018 | Filed under Art Seen: National and tagged with Luhring Augustine, Michelangelo Pistoletto, Paige Landesberg, Scaffali, The Seen.